A few weeks ago, I schlepped it over to Kensington as moral support for my girl Kat who was giving a talk at Olympia. Despite playing the part of supportive friend, I mostly just went for the promise of lunch at Dirty Bones afterwards. Soz, Kat. 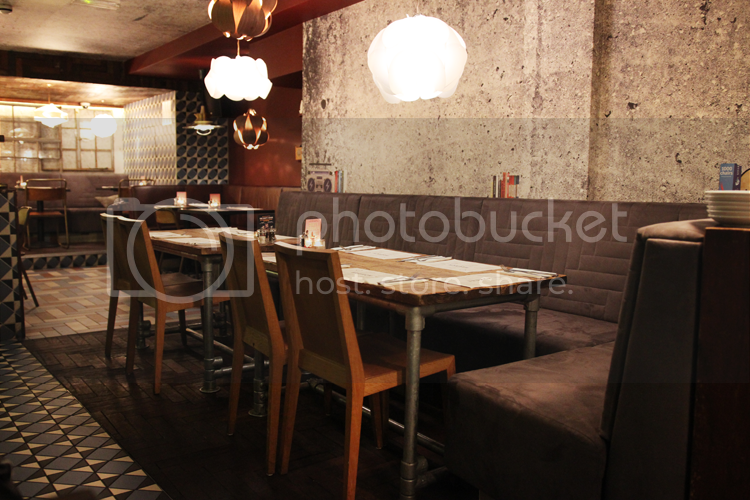 Fittingly for a place with such filthy-delicious food, Dirty Bones is actually located underground. It feels anything but dismal, though. 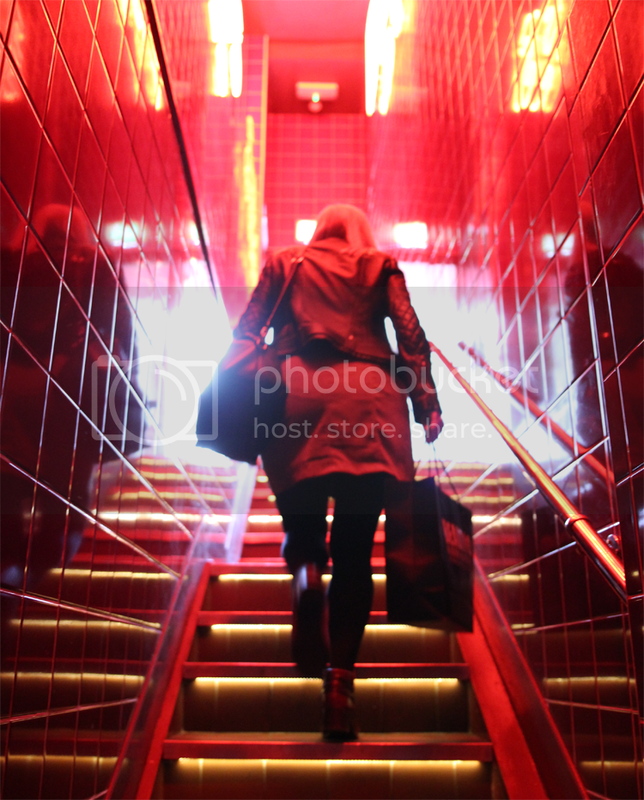 Atmospheric, sure, not a lot of light in the restaurant itself (hashtag blogger problems), but the descent into the land of dutty burgers is illuminated by a staircase bathed in red light. The menu is possibly one of the most difficult things I’ve ever had to choose from. It’s split into sections: Bones, Burgers and Dogs, with a host of drool inducing menu items. The drinks menu is just as tempting, mostly a fairly boozy affair with creative cocktails and plenty of wine, plus a few cursory soft drinks and milkshakes. 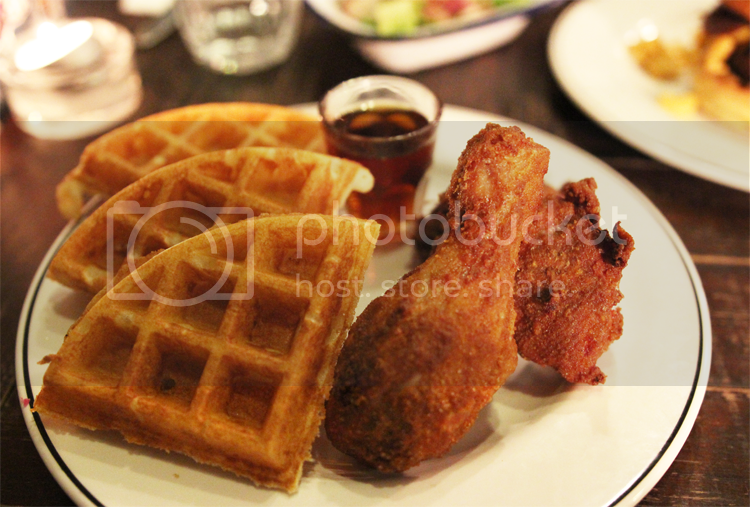 In the end, we decided to share two mains – the Mac Daddy burger and Chicken & Waffles. This was a damn good decision. The Mac Daddy (£10) is obscene. A 6oz aged steak burger in the now ubiquitous brioche bun, topped with pulled beef short rib, barbecue sauce and, yes, mac and cheese. Mac and cheese! In a burger! What a time to be alive. What a way to clog your arteries. If I’d have had a heart attack then and there, I’d have died happy. 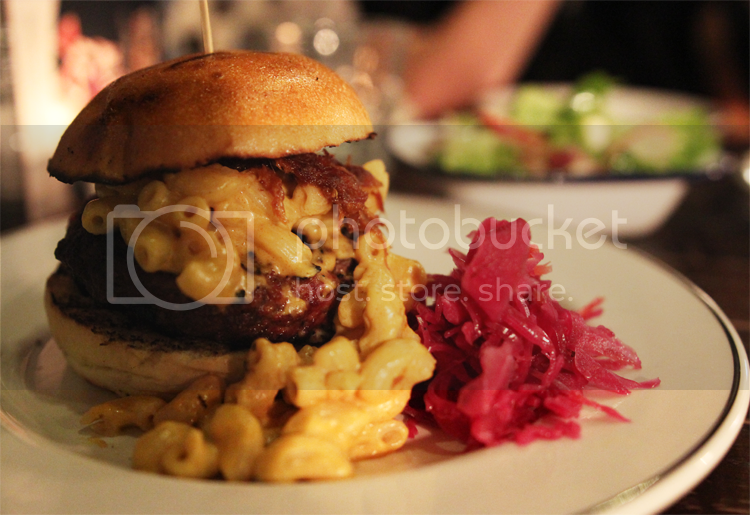 Juicy, meaty burger, sticky melt-in-the-mouth pulled beef, cheese oozy macaroni… heaven. The house made pickles on the side is perfect to cut through with a bit of crunch and sweetness. The Chicken & Waffles (£10) were equally ridiculous. Some boneless, some bone-in, the spices they use in the coating must be made by fairies or something because I’m not sure I’ve ever eaten tastier chicken, like, ever. The chicken itself is so juicy, not a hint of dryness or stringiness in sight, and when you serve that with freshly baked waffles and a shot of maple syrup you’re pretty much laughing your way to a foodgasm. I’m just going to come out and say it – Dirty Bones’ chicken and waffles is actually better than Stax. I honestly don’t know how I’m going to choose between the chicken and the burger next time. Serious first world problem, huh? Now, because that clearly wasn’t enough food, we each got something sweet from the brunch menu to masquerade as dessert. 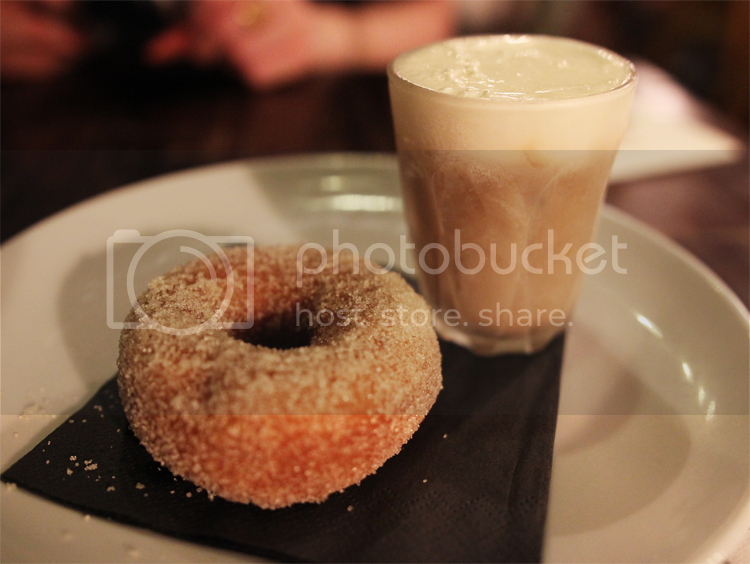 Kat went for Coffee & Donuts (£5), which is a teensy bit of a misnomer considering it’s coffee gelato with one doughnut, not plural. But Kat seemed to enjoy it all the same! 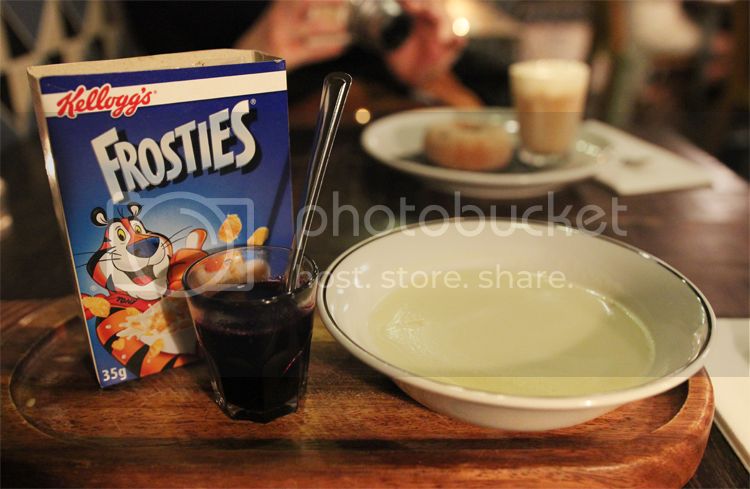 I went for Milk & Frosties (£6), which is described as “sweet milk panna cotta served with frosties”. I was expecting your standard shaped panna cotta turned out of a ramekin, like this, with a sprinkling of Frosties on top. What I got was WAY better than that. 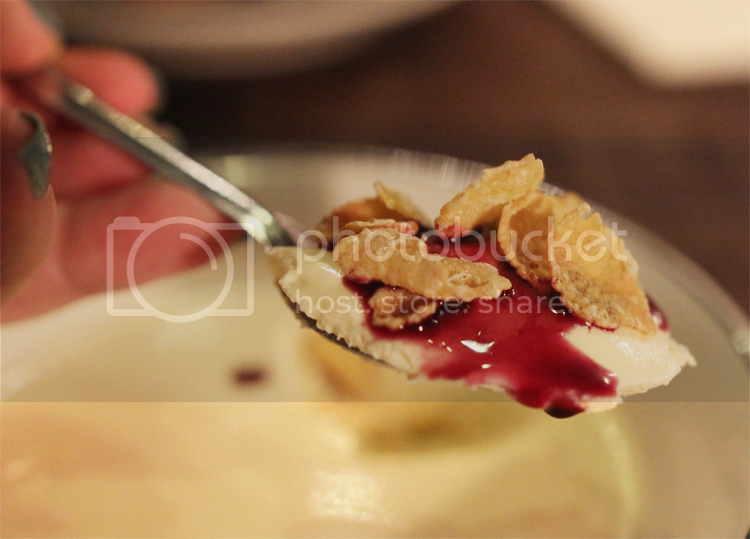 An actual cereal bowl full of perfectly silky panna cotta, an actual cereal box of Frosties, and, because obviously your daily RDA of sugar isn’t already pushed to the limit with those, a shot-glass of sweet berry coulis. Ascending the red stairs on the way out is rather more taxing than coming down, especially when you’re a mere few grams away from bursting point. But hot damn, is it worth it. 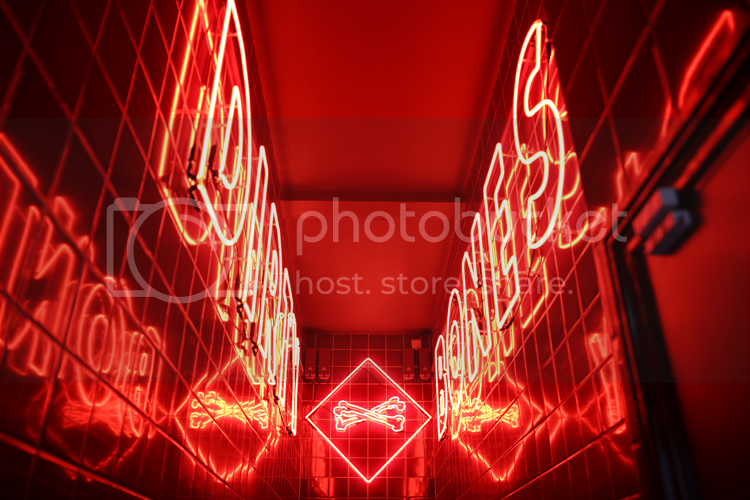 Dirty Bones have two locations, on Kensington Church Street and in Kingly Court just off Carnaby Street. Visit one, I promise you won’t be disappointed. You can – and should – also sign up for a free Friends With Benefits loyalty card which gets you some banging offers and discounts, including 25% off your bill anytime Sunday – Thursday. Winner! Why isn’t this halal?!!! I’m so bloody jealous. Still, blood is flowing through my arteries.